I LOVE PASTA! That’s all there is to it. I try to minimize my carb intake, especially at night. That being said, sometimes I have to give in to my craving for a big bowl of pasta. In the summer months, this dish is perfect. I know perfect is a strong word, but really, it applies to this pasta. Tomatoes are just starting to come into season in my neck of the woods. So last weekend, when I was at the farmers market, I scooped up 2 large pints of cherry heirlooms. These tomatoes have a sweet, tangy, candy like quality to them. Perfect (there’s that word again) to be eaten raw. This recipe is simple to make, and it only takes 15 minutes to put together. During the week, this is exactly the type of dish I am looking for. I added shrimp to round out the meal with a bit of protein, but you can very well leave it out. The key to this recipe is making sure the spaghetti is still warm when you toss it with the rest of the ingredients. The warm spaghetti absorbs the fresh flavors of the tomatoes, garlic, and basil. This results in the perfect (had to throw it in there one more time) dish. Bring a large pot of water to a rapid boil. Cook pasta 10 minutes until al dente or according to package directions. Reserve 1/4 cup of pasta water. Drain pasta and immediately add to serving dish. While pasta is cooking, preheat a saute pan to medium-high. Season shrimp with salt, pepper, and Italian seasoning. Add 1 tbsp of olive oil to hot pan. Saute shrimp for 5 minutes turning half way through the cooking process. Remove shrimp from pan, top with lemon juice, and reserve. To warm pasta, add tomatoes, garlic, 1/4 cup olive oil, the reserved pasta water, crushed red pepper flakes, salt and pepper. Toss to combine. 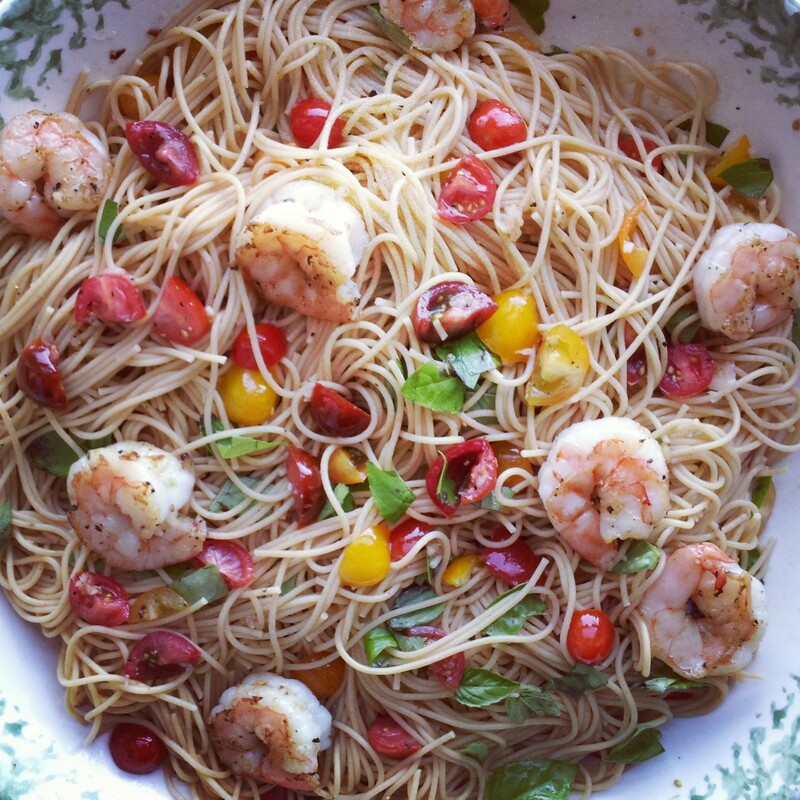 Add basil leaves, toss, top with reserved shrimp, and serve. Enjoy with a crisp glass of Sauvignon Blanc. Thank you for your comment. I hope you like the dish as much as I did. Enjoy!